Like many quarterbacks who aren't blessed with great foot speed, and even many who are, Nick Foles is only as good as his protection. When his offensive line gives him time to throw, he doesn't need to take a back seat to anyone, as he proved in 2013 when he led the NFL in passing, and again last winter when he posted a 115.7 passer rating in the playoffs and was named the Super Bowl MVP. When his line doesn't protect him, well, you get the horror show you saw in the preseason this summer when Foles turned the ball over five times in 10 possessions, was sacked six times in 32 pass plays and finished with a 48.7 passer rating. 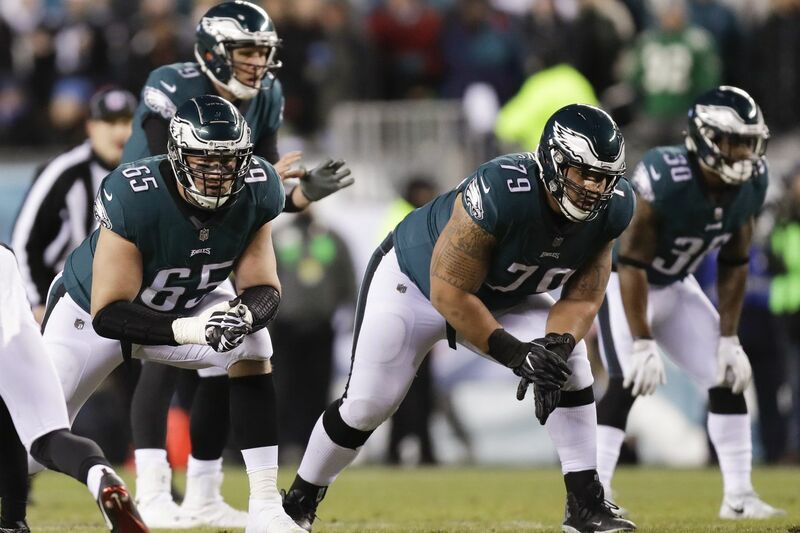 "I think Nick functions better when his offensive line is functioning better,'' center Jason Kelce said. "When we give him time to feel comfortable, to sit back there and make throws, he plays better. And quite frankly, our offensive line didn't do a very good job of making him feel comfortable in the preseason. "As long as we're able to do that this week, as long as we're able to make him feel confident and be able to go through his progressions and go through his reads, Nick has proven he can be a good quarterback." Kelce and the rest of the Eagles' offensive line gave Foles tremendous protection in the playoffs. He was sacked just twice in three postseason games, and hit only seven times and hurried 22 times, according to Pro Football Focus. In their 15-10 divisional-round win over the Falcons, he completed 23 of 30 passes and was sacked just once. On that one, he tripped over Falcons defensive end Takk McKinley when he tried to step up in the pocket. "Obviously, he feels he needs to play better. But football isn't a game of just one guy playing bad. When a guy like Nick has proven that he can play at a high level and is struggling, it's never just that one guy. "And the common theme in the preseason was we didn't do a good job of giving him the time and giving him the confidence to sit back there and go through his progressions without having to worry about getting hit." As they did heading into the playoffs last winter, Doug Pederson and his staff also have tailored the game plan around what Foles does best. "He went through the whole playbook and said, 'This is what I think I'm good at. This is what I'm comfortable with.' And then it rolled from there. "But that's the way it is with any quarterback. You determine what they do best, what they comfortable with. And then you hone in on that." How will Carson Wentz’s injury affect his play? At some point in the next few weeks, Carson Wentz will be cleared to play by the Eagles' medical staff and return to the lineup. But which Carson Wentz will it be? Will it be the same one who tried diving into the end zone against the Rams last Dec. 10 and ended up with a season-ending knee injury? Will it be the same one who ran the ball 64 times last season and had 27 rushing first downs, which was the sixth most among NFL quarterbacks? Or will it be a more cautious, safety-first Carson Wentz? All indications are that Wentz has no intention of altering his aggressive playing style. He said as much last January. Wentz isn't going to stop doing one of the things that makes him special, and I'm not sure that he should. His ability to extend plays and move the sticks with his feet when his receivers are covered was a big reason the Eagles took him with the second pick in the 2016 draft. "You don't want to say, 'Hey, I'm one of maybe the top three quarterbacks in the league, but now, I'm going to take something that I do well and not do it and make myself a top-10 or a top-12 quarterback;' I don't think you're going to see that,'' said Hall of Fame coach and current NBC Sunday Night Football analyst Tony Dungy. "What he's going to do is what all the guys learn. And that's to be smarter with it. There will be times when he's going to say, 'I've got to make a first down.' But five plays from now, the situation may be different and he'll have the same decision to make and he may do something different. On a scale of 1 to 10, Troy Vincent thought Brian Dawkins' Hall of Fame speech was a 10. Dawkins talked about his battles with depression and his thoughts of suicide early in his career. He encouraged people fighting the same demons to get help. What was most impressive about Dawkins' speech was that he winged it. "On the car ride over to the ceremony, I said, 'Let me see your notes; let me see what you got,''' Vincent said. "He reached down between his legs and showed me a balled-up piece of paper and handed it to me. "I said, 'Man, there's no way we can go on stage like this.' We called [former Eagles teammate] James Thrash up and we prayed. And Brian said, 'The good Lord is going to lead me today, T.' And that's what we got." • The Eagles' 106 first-quarter points last season were the third most in the league. Only the Rams (119) and the Saints (107) had more. • The Eagles used "11'' personnel (1 running back, 1 tight end, 3 wide receivers) last year much more than they did in Doug Pederson's first year. They used "11'' on 65.1 percent of their offensive plays last season, which was an 8.8 percent increase over 2016. In '16, they used multiple-tight-end sets 40.4 percent of the time. That dropped to 32.3 percent last year. With Alshon Jeffery not expected to play Thursday, the Eagles could use more "12'' and "13'' personnel groupings with Zach Ertz and rookie Dallas Goeddert. In their playoff win over the Falcons, the Eagles used "11'' personnel on 42 of 63 plays. They used two or more tight ends on the other 21 plays. • The Eagles ran the ball 41.6 percent of the time in "11'' personnel during the regular-season last year. In their playoff win over the Falcons, however, that number jumped to 50 percent. Twenty-one of the Eagles' 32 rushing attempts against the Falcons were with "11'' personnel. • The Eagles have beaten the Falcons the last two times they've faced them despite not throwing a touchdown pass in either game. • Eagles quarterbacks didn't throw an interception in the red zone last year in 77 regular-season and postseason pass attempts. Their last red-zone interception was in Week 14 of the 2016 season, by Carson Wentz. It was his one and only red-zone interception that year. • The Eagles finished fourth in points per drive last season (2.31). behind the Rams (2.40), Saints (2.44) and Patriots (2.69). • In the Eagles' playoff win over the Falcons, Nick Foles attempted just two throws of 20 or more yards. Both were incomplete. He was 4-for-5 for 67 yards from 11 to 19 yards, 13-for-15 for 114 yards from 0 to 10 yards and 6-for-6 for 65 yards on throws behind the line of scrimmage. Foles was 8-for-13 for 274 yards and four TDs on 20-plus yard throws against the Vikings and the Patriots. Darren Sproles will likely be returning kickoffs this season. The Atlanta Falcons’ Julio Jones doesn’t have as many red-zone TDs as you’d expect. • Falcons wide receiver Julio Jones has 585 career receptions and 43 touchdown catches in seven seasons. But he's only had more than two red-zone TDs in a season twice in those seven years. He had five in 2015 and seven in 2012. • In the last 20 years, the Super Bowl winner has made the playoffs the next year 12 times. Just three of the last six Super Bowl winners have made the playoffs the following season. • The Eagles were just the second team since 2003 to win the Super Bowl the year after finishing last in their division. The '09 Saints were the other team. • The Falcons allowed more than 26 points in a game just once last season. That was in a 34-31 Week 11 win over Seattle.